Wes Ellis: Jesus and Empire... Why no Eucharist? Jesus and Empire... Why no Eucharist? Yesterday I went to a panel discussion featuring Scott McKnight, Efrem Smith, Brian McLaren, Shane Claiborne, and Don Golden on "Jesus and Empire." This Jesus and empire theme keeps coming up all around me. Not only is it a theme I can't help anymore but see throughout scripture but it's implications are all over everything I read and write lately. In my senior seminar paper I used this concept (though it was in different terms: Church as alternative society). If you're not familiar with it there are a few books to look at including Jesus and Empire by Richard Horsley, Colossians Remixed by Brian J. Walsh and Sylvia C. Keesmaat, and it could never hurt to check out The Challenge of Jesus (though it isn't really directly a "Jesus and Empire" book) by N.T. Wright. I will explain it quickly here; it's a hermeneutic for the text and for life that interprets Jesus' and Paul's perspectives as declaring the Kingdom of God not just arbitrarily but overtly against the Roman Empire and thus any system or nation-state like it. This calls us to be on the lookout for empire, wherever it rears its' ugly head, and declare God's Kingdom over against it here and now. It means drawing clear boundaries between church and state in the sense that the church is an alternative society altogether and a world society not a society identifiable with or submissive to any worldly government or state. Listening to these guys talk about this subject was encouraging and exciting. I was encouraged that people were articulating ideas of which I have grown very intrigued and in which I have begun to live my life. I was excited about the dream of a church which is no longer married to a national patriotic narrative. I was excited about the dream of a church that clearly identifies with the Body of Christ instead of confusedly identifying with the American flag. It was a truly apocalyptic vision for me and it's one I have been trying to articulate myself. Each speaker had time to discuss in length where they see empire in the world today and where they see the church responding. As encouraging and exciting as this panel was, there was one theme which I kept waiting to be addressed and it never was. In fact, I have been waiting for it to be brought up in any conversation about Jesus and empire. The subject of empire is so popular right now among evangelical progressives but they still don't talk about what I think is at the heart of all this--the Eucharist. It's something I wish more evangelicals would wake up to but it has been so ignored. The Eucharist makes the church visible and it draws them together in identity as the Body of Christ and as wholly dependent upon that Body both in word and in deed. It makes the church visible even while the empire seeks to manipulate and disappear the church. It draws clear and visible distinctions between church and empire as it excommunicates those things to which the Kingdom of God community is contrary. It provides the proper eschatological hope as it embodies the Kingdom of God now, anticipating the day when all will eat bread from God and not from Caesar and when the murderers of Christ are reconciled to his Body. it puts the Body of Christ on display within the world calling the future into the present. These men may mention the idea in their books (and I am sure Shane Claiborne has), of that I am not sure, but it's curious to me that it doesn't come up at conferences like this one. If I've lost you completely there are two books you need to read. First, The Eucharist: Bodies, Bread, and Resurrection by Andrea Bieler and Luise Schottroff. Second, there is a book I wish Golden, Smith, McKnight, McLaren, and Claiborne would all read if they have not already (and, by the way, Shane defiantly has since he quotes it in Jesus for President) --Torture and Eucharist by William Cavanaugh. 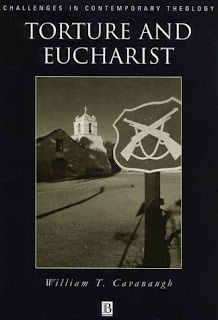 "...Eucharist builds a visible social body capable of resisting the state's strategy of disappearance. The Eucharist anticipates the future Kingdom, re-members Jesus' conflict with the powers of this world, and brings both future and past dimentions of Christ into the present in the form of a visible body. The result is a 'confusion' of the spiritual and the temporal, an invasion of worldly time and space by the heavenly, and thus the possibility of a different kind of social practice." Thanks for the humbling reminder. I do remember now seeing a few Cavanaugh footnotes in Jesus for President. I still just found it surprising that Eucharist has not been mentioned at this little conference I'm at. When the question was asked by Scott about "preterist" theology in the panel discussion, I thought that Eucharistic eschatological hope would have been a helpful idea to refer to. I just think Eucharist is a source into which evangelical progressives such as those speaking here would be smart to tap into more often. To me it's the heart of it all. I hope I didn't offend. Irresistible Revolution changed my life and I never wish to downplay the beauty of all that you (Shane) are doing.